COSTILLA -- More than 5,000 native Rio Grande cutthroat trout are swimming in Comanche Creek and its tributaries, contributing to a healthy population of New Mexico's state fish and beckoning anglers to enjoy some of northern New Mexico finest fishing opportunities and scenery. The New Mexico Department of Game and Fish stocked the cutthroats into the river July 2 as part of an ongoing effort to restore pure-strain native trout to more than 150 miles of streams and 25 small lakes in the Rio Costilla watershed. The Comanche Creek portion of the project included about 20 miles of small streams in the Valle Vidal Unit of the Carson National Forest. The project included construction of barriers to prevent non-native fish from traveling upstream, and removal of all non-native fish above the barriers. "Stocking the native cutthroats back into the streams was the last phase in restoring the pure-strain natives to the Comanche Creek watershed," fisheries biologist and project coordinator Kirk Patten said. "This project will protect New Mexico's state fish and help keep the species off state and federal endangered lists. It also will give anglers an opportunity to catch a species of trout found only in northern New Mexico and southern Colorado." Fishing season on Comanche Creek and the rest of the Valle Vidal is July 1 through Dec. 1. Regulations for Comanche Creek are catch-and-release only, with tackle restricted to artificial flies and lures with single, barbless hooks. 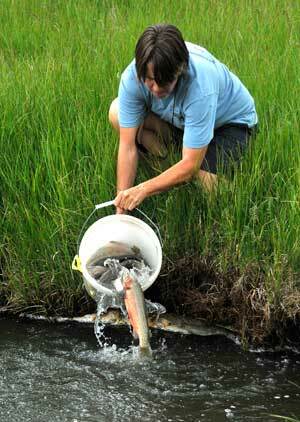 The fish stocked throughout the watershed July 2 included 600 12-inchers and 4,500 4-inchers. "While we encourage anglers to take advantage of this fishing opportunity, we also urge them to handle the native trout with care," Patten said. "We want to give the fish every opportunity to thrive and spawn." For more information about Rio Grande cutthroat trout restoration and angling, please visit www.wildlife.state.nm.us.